Congratulations to Leah Farr for completing her N.C. Environmental Education Certification. Leah is a park ranger at Jordan Lake State Recreational Area near Apex, North Carolina. At Jordan Lake, Leah teaches informal education programs, maintains campgrounds, and enforces park regulations. Leah is also a Girl Scout leader, and she said the skills she gained in the certification program helped in both of her roles. Leah's favorite part of the certification program was the variety of learning opportunities. In particular, she enjoyed that every workshop and class offered something new. "Before this program, I didn't give myself enough opportunities to teach," Leah said. Through hands-on courses in teaching methodologies, Leah learned about age-appropriate environmental activities. Leah said she now has a better understanding of how to break down educational programs for younger audiences and provide more rigorous programs for adults. For her community partnership project, Leah partnered with the UNC Institute for the Environment's Caterpillars Count program. 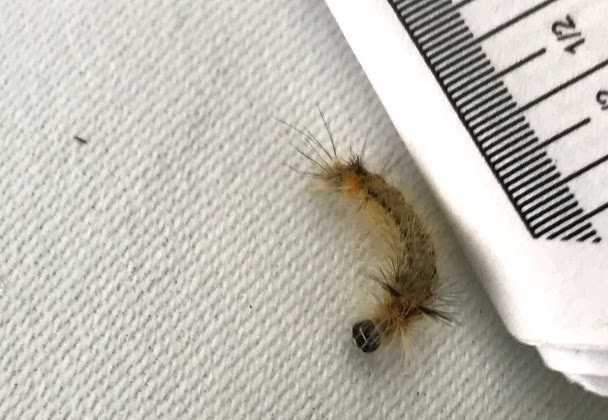 Caterpillars Count is a citizen science program for measuring seasonal variation and abundance of caterpillars, beetles, spiders, and other arthropods. Leah set up Caterpillars Count survey sites at Jordan Lake and invited both visitors and park rangers to help her search for and identify arthropods. Leah's community partnership project was inspired by a need to expand the knowledge of local species at Jordan Lake. Leah realized that a citizen science project would be the perfect way to engage visitors in environmental education. "Our community varies daily because of the nature of our location. We have some repeat patrons but we also needed a better way to reach out to the rotating patrons." To conduct Caterpillars Count surveys at Jordan Lake, participants simply shake designated trees and let the arthropods in the trees fall onto a "beat sheet," a large white sheet that allows participants to easily see the organisms. Participants then document all the arthropods they see and identify the species if possible, although species identification is not required. "This flexibility takes pressure off those who just want to search for new species and not worry about identifying every type of arthropod." Leah also involved the public through the use of the N.C. State Parks system's online database. The N.C. State Parks System Natural Resources Inventory Database allows users to view lists and photos of plants and animals found in all of North Carolina's state parks. Leah uploaded pictures and other biological information about the arthropods found during Caterpillars Count surveys to Jordan Lake's species list. As Leah pointed out, "This database is a great way to reach out to people who are just looking for a check off list for their hiking or camping trip." Leah said her time in the certification program changed her understanding of the natural world. "I believe I have a broader understanding of how to approach and learn about environmental issues. I pay more attention to species, habitats, and changes happening in our environment." To learn more about the N.C. Environmental Education Certification, visit the Office of Environmental Education website.